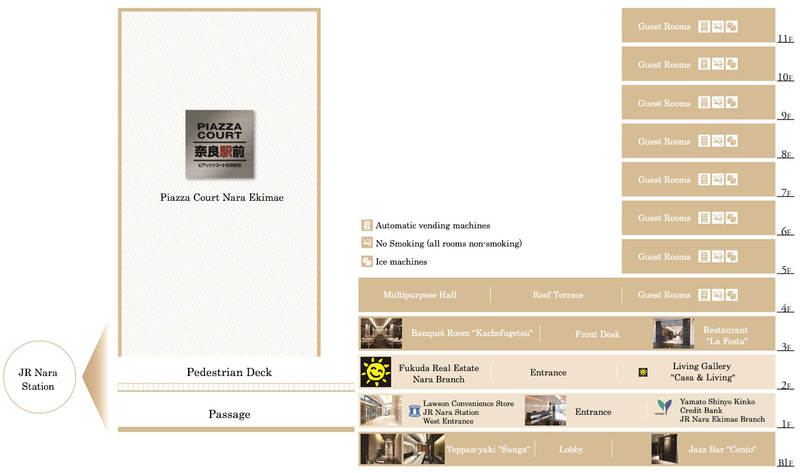 Piazza Hotel Nara is located alongside JR Nara Station, known as the gateway to Nara. Whether revisiting or visiting for the first time, we welcome you to discover your own "Nara". We at Piazza Hotel Nara are here to assist you with your stay. An excellent location, within walking distance to Nara Park and other tourist destinations. * For use, please feel free to contact reception. * Please note that these items are only available for temporary loan. Please do not bring pets, such as dogs and cats, into the hotel. For valuables such as cash and jewelry, please use the in-room safe. Broadcast channels are available free of charge. All rooms have Wi-Fi access. Ice machines and vending machines are located on Guest Room floors. For hot water, please use the electric kettle provided in the room. "Piazza Hotel Nara", a new landmark overlooking the history of Japan's ancient capital, Nara.